This evaluation brief provides a summary of the first implementation of the Learning Differences MOOC-Ed developed with support from the Oak Foundation. Initial findings suggest that the course has been effective in supporting the professional growth of participating educators. Specifically, the vast majority of educators report that, as a result of their participation, they have deepened their understanding of learning differences, and have applied new knowledge and skills to make positive changes to their professional practice. To improve future iterations of this MOOC-Ed, participants recommended improvements to the discussion forums, more opportunities for deeper peer engagement, and greater differentiation. Citation: Branon, S., Freeman, S., Kellogg, S., Weedfall, A. (2016). Oak Foundation MOOC-Ed Report. Prepared for The Oak Foundation. The Friday Institute has learned a lot about the implementation of micro-credentials through our pilots of the Learning Differences and Fractions Foundations stacks. To date we’ve reviewed roughly 500 submissions from educators in 98 countries around the world. Educators are getting excited about them, and I am too. Now, though, I wonder how districts can use micro-credentials support educators. Start by testing the waters in the shallow end. Take an already existing session and make it competency based. When I was coaching new teachers, I had teachers work on a product during a session I facilitated. They didn’t sign in for credit until the end when they shared their product with me. Those who needed more time emailed me their products at a later date, but they didn’t get credit for the session until they demonstrated mastery of the skill. This small tweak emulates the competency based approach and might allow district leaders to get a feel for the potential value of micro-credentials as well as the potential push-back such a system will create. Build micro-credentials around new professional development. If you’re already going to be developing something new, you could try a single micro-credential or stack and see how it goes. I’ve found that education tech topics (e.g., using Google Apps for Education in your classroom) lend themselves well to the micro-credential framework, and people are willing to try them in that space. Many have taken this approach, including Winston Salem-Forsyth County Schools, Surry County (who also gamified their micro-credentials! ), Charlotte-Mecklenberg, and New Hanover County. Pilot a few micro-credentials with your “early adopters.” Every district I’ve worked with has some set of formally or informally recognized early adopters - the teachers who are eager to try new things, give good feedback, and help make it better. Pilot a set of micro-credentials to get these teacher leaders on board, get their feedback, and start building buzz in your district about micro-credentials. These represent only a few ways for district leaders to start implementing micro-credentials and explore their potential. As more and more districts try these out, I hope to learn from their experiences. When I was a teacher, I valued every day in my classroom. When professional development required me to miss a day with my students, I wanted to be sure it was going to be meaningful. These day-long sessions often left me inspired to make changes in my classroom practice. However, the following day I would return to my classroom and real-world demands would kick in. The changes seldom happened. When I first learned about micro-credentials, I was immediately excited about the potential to address this common problem. Micro-credentials provide educators an opportunity to take control of their professional development. With micro-credentials, educators can self-select learning experiences that support their professional goals. Educators can also learn the content in a way that best meets their learning needs and receive credit for that learning once they’ve demonstrated concrete connections to their practice. Additionally, micro-credentials provide a way for educators to receive recognition for these demonstrated skills. Teachers who earn micro-credentials want to earn more of them. More than 97 percent of surveyed participants who earned the first micro-credential in one of our our Learning Differences stacks indicated that they wanted to earn another one, demonstrating that the more people learn about micro-credentials, the more interested they become. Micro-credentials facilitate concrete applications to classroom practice. One of the coolest parts of reviewing the micro-credential submissions has been seeing what educators are doing in their schools and classrooms around the world. With micro-credentials they are no longer asked to merely think about change, they are asked to demonstrate this change — addressing the dilemma I and many other educators have experienced in the past. The paper highlights some of our favorite submissions. Micro-credentials scaffold teachers to engage at an increased level of rigor. To encourage teachers to make meaningful changes in their classrooms, the micro-credential rubrics provide support for teachers as they engage with the content, assisting them as they move from recalling the information to changing their classroom practice. Teachers can demonstrate competency/mastery in a variety of ways. We have seen educators submit videos, pictures, poems, and student work to demonstrate their mastery of our learning differences competencies. Micro-credentials allow educators to do what works for them to make the most of each learning experience and truly meet their needs. Instructional design and online platform matter. Effectively designing instructionally appropriate micro-credentials was the steepest learning curve we experienced. Our team had to figure out a way to streamline the content as much as possible, while still providing educators with everything they needed to build their knowledge, understand the requirements, and easily submit their submissions. Plus, we had to figure out how to meaningfully give educators formative feedback that would be useful to them. If it’s not easy to use the platform, educators will get confused, frustrated, and leave. Unfortunately, in our initial pilot, more than 50 percent of educators dropped out of the process before completing their submissions. However, after gathering feedback and streamlining the process to make it simpler for users to navigate, that number fell to around 27 percent. Micro-credentials should not have a one-size-fits-all approach. It has become abundantly clear that there are many ways to approach building micro-credentials to best support educators. The potential here is exciting, and we cannot wait to see what types of micro-credentials emerge. What’s the right grain size for a micro-credential? How do we scale micro-credentials? What are the necessary incentives for teachers to engage with these micro-credentials? Should micro-credentials be connected to systemic processes like teacher licensure and relicensure? As more organizations build micro-credentials, how can we continue to ensure high-quality micro-credentials? The biggest lesson we’ve learned is that there is so much potential for (and lessons to learn about) micro-credentials. Micro-credentials could be the game-changer teachers have been hoping for in professional development. Read more about our lessons learned by reading the full paper available here. Statistics continues to receive increasing attention in K–12 curricula through Common Core and recommendations from the American Statistical Association (ASA). Professional development opportunities for secondary teachers to develop their statistical content and pedagogy are popping up across the country, typically on a small local scale. The need is much bigger than what can be addressed with small local programs, however, so this paper discusses a way of leveraging the Internet to assist in a solution. Online courses can expand the number of teachers reached and create communities beyond school or district lines. For a “massive” and “open” course, there are many design challenges to meet the needs of participants with varied backgrounds. Most Massive Open Online Course (MOOC) participants engage in isolation, reviewing material individually and perhaps engaging in discussion forums. In this column, we share how two teams, a Duke team and an North Carolina State team, took on the challenge of designing and implementing two MOOCs that could assist teachers in teaching statistics. This evaluation report documents the Friday Institute’s development and implementation of three MOOC-Eds funded by the William and Flora Hewlett Foundation: Fraction Foundations, Disciplinary Literacy for Deeper Learning, and Teaching Statistics through Data Investigations. Findings show that the Friday Institute has been largely successful in designing professionally relevant learning experiences with opportunities for both personalization and peer support. As a result, educators have reported improvements in their knowledge and skills, as well as positive changes to their professional practice. The findings also illustrate that even well-designed MOOC-Eds face significant challenges in scaling learning that embodies the principles of effective professional development. Citation: Kleiman, G., Kellogg, S., Booth, S. (2015). MOOC-ED evaluation final report. Prepared for The William and Flora Hewlett Foundation. MOOC-Ed researchers Dr. Eric Wiebe, Isaac Thompson, and Dr. Tara Behrend respond to a previous article in Educational Researcher that studied MOOCs with a systems level view of behaviors where a student traverses from one end to the other of the system without any acknowledgement of student agency in learning. The authors assert that, instead, researchers should be applying mature psychological models of human agency to guide emerging data-mining tools, which not only leverage the largely untapped reservoirs of log data in a manner that leads to a better understanding of motivation and self-regulation but also inform the next generation of scalable learning environments. In this guest post for WestEd, MOOC-Ed Project Director and FI Executive Director Dr. Glenn Kleiman discusses the design of MOOC-Ed courses and the use of resources created by WestEd in the Fraction Foundations MOOC. Read the full post at WestEd. The Friday Institute’s Massive Open Online Courses for Educators (MOOC-Eds) initiative builds upon our prior work designing, implementing and researching small cohort, facilitated online workshops through the EDC EdTech Leaders Online program and online professional learning communities, cohorts, and courses at the Friday Institute. Provide scalable, accessible, cost-effective professional development. Beginning in 2012, we launched a set of MOOC-Eds for district and school leaders and educators. These MOOC-Eds build upon four major design principles that reflect research-based practices for educators’ professional learning: multiple voices, self-directed learning, peer-supported learning and job-connected learning. We then developed instructional elements—specific things that participants use and do–that instantiate these principles in the courses. We have an active research program, using the extensive data available to explore participants’ self-directed learning paths, interaction patterns for peer-supported learning, the value of different types of resources and activities, and the impact of MOOC-Eds on participants’ knowledge and practices. This chapter will summarize what we have done and learned so far, with an emphasis on design principles and how they are incorporated into specific instructional elements within the MOOC-Eds. Kleiman, Glenn M., & Wolf, Mary Ann (2016). Going to Scale with Online Professional Development: The Friday Institute MOOCs for Educators (MOOC-Ed) Initiative. In Dede, C., Eisenkraft, A., Frumin, K., & Hartley, A. (Eds. ), Teacher Learning in the Digital Age: Online Professional Development in STEM Education (pp. 49-68). Cambridge, MA: Harvard Education Press. A recent phenomenon in the MOOC space has been the development of courses tailored to educators serving in K-12 settings. MOOCs, particularly as a form of educator professional development, face a number of challenges. Academics, as well as pundits from traditional and new media, have raised a number of concerns about MOOCs, including the lack of instructional and social supports. It is an assumption of this study that challenges arising form this problem of scale can be addressed by leveraging these massive numbers to develop robust online learning communities. This mixed-methods case study addresses critical gaps in the literature and issues of peer support in MOOCs through an examination of the characteristics, mechanisms, and outcomes of peer networks. Findings from this study demonstrate that even with technology as basic as a discussion forum, MOOCs can be leveraged to foster these networks and facilitate peer-supported learning. Although this study was limited to two unique cases along the wide spectrum of MOOCs, the methods applied provide other researchers with an approach for better understanding the dynamic process of peer supported learning in MOOCs. Kellogg, S., Booth, S., & Oliver, K. M. (In Press). A social network perspective on peer support learning in MOOCs for Educators. International Review of Research in Open and Distance Learning. 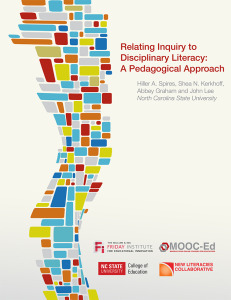 In the Disciplinary Literacy for Deeper Learning MOOC-Ed, we intentionally relate inquiry to disciplinary literacy in core subjects (English/Language Arts, Science, History & Social Studies, & Mathematics). For a full explanation of our 5-phase inquiry process and how the intellectual processes may differ based on discipline, please click here. Educating Educators: Designing MOOCs for Professional Learning is a chapter from the book, Massive Open Online Courses: the MOOC Revolution. 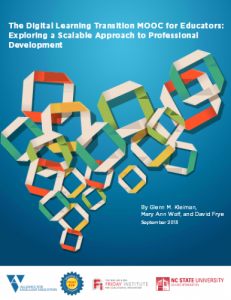 Written by the Friday Institute’s Executive Director Glenn Kleiman, Director of Digital Learning Programs Mary Ann Wolf, and Associate Director David Frye, this chapter describes the first year of their efforts, lessons learned, design principles underlying their work, and future directions of MOOC-Eds – Massive Open Online Courses for Educators. Summary: Peer interaction in MOOCs for K-12 educators, influenced in part by underlying network mechanisms, resulted in productive and meaningful exchanges driven largely by small core of highly engaged participants. Written by Shaun Kellogg, Sherry Booth, and Kevin Oliver for the Bill and Melinda Gates Foundation MOOC Research Initiative. This report has not yet been peer-reviewed. In conjunction with the relaunch of the Digital Learning Transition (DLT) Massive Open Online Course for Educators (MOOC-Ed) in September 2013, the Alliance and the Friday Institute released The Digital Learning Transition MOOC for Educators: Exploring a Scalable Approach to Professional Development, a new paper that describes the design of the DLT MOOC-Ed; examines results from the first course as determined from web analytics, analyses of online discussions, and survey data; and offers lessons learned about this new approach to professional development. Why a MOOC-Ed on the Digital Learning Transition? This document, written by Glenn Kleiman and Mary Ann Wolf, succinctly explains the need for Massive Open Online Courses for Educators, lays out the founding principles of effective professional development for educators, describes the purpose of the Digital Learning Transition MOOC-Ed, and details the four major design guidelines that have contributed to the success and effectiveness of MOOC-Eds.